GitGutter lets you see in real time what’s changed since a past commit. After each edit of the current view, it invokes git diff against a commit of your choosing and displays an icon in the gutter for each line that was inserted, modified, or deleted. 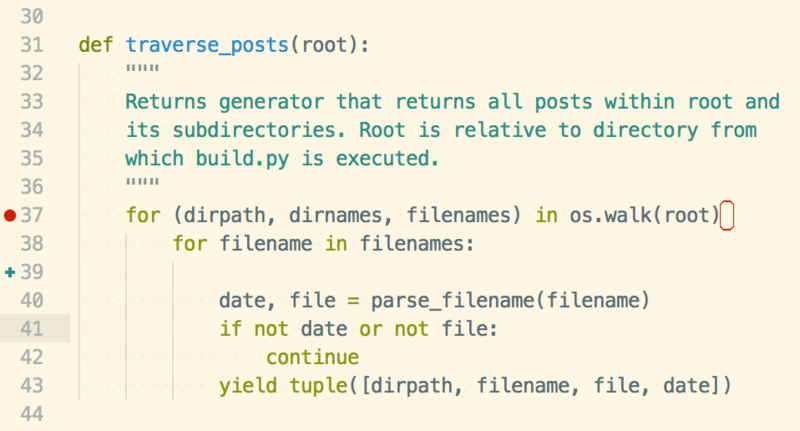 Calls to git diff are debounced in the same way that SublimeLinter debounces calls to linting executables. The only thing that bothered me is that GitGutter icons and SublimeLinter icons compete for that primo gutter real estate. It’s a race condition: whichever plugin renders its icons first gets overwritten moments later by the other. I’d rather know that my code will blow up at runtime than know if it’s been modified, so I wanted SublimeLinter to take precedence. Luckily, GitGutter’s API allows you to specify “protected_regions” of the gutter that are off limits to the plugin, and buried in here are the regions corresponding to SublimeLinter. Voilà! GitGutter gets out of SublimeLinter’s way, and everyone’s happy. If this fix stops working, restarting Sublime Text will usually make it work again.